Understanding Conflict and War: An Overlooked Classic? Soon after it was published, a perspicacious review of R.J. Rummel’s Understanding Conflict and War (UCW) predicted that the work would ‘not have the immediate impact … that one might otherwise expect from a work of such scope written by one of the more famous names in the field’ (Ray, 1982: 185). By 1988, Rummel himself acknowledged regarding UCW that ‘I did not expect it to be a hit’, but that ‘I was not prepared … for UCW to be so widely ignored’ (personal correspondence). James Lee Ray, b. 1944, Ph.D. in Political Science (University of Michigan, 1974); Emeritus Professor, Department of Political Science, Vanderbilt University (2013–); author of Democracy and International Conflict (University of South Carolina Press, 1995, 1998), and articles in British Journal of Political Science, International Organization, International Studies Quarterly, Journal of Democracy, and Journal of Peace Research; current main interests: golf, fishing, movies, and power naps; Email: james.l.ray@vanderbilt.edu. Soon after it was published, a perspicacious review of R.J. Rummel’s Understanding Conflict and War (UCW)1 predicted that the work would ‘not have the immediate impact … that one might otherwise expect from a work of such scope written by one of the more famous names in the field’ (Ray, 1982: 185). By 1988, Rummel himself acknowledged regarding UCW that ‘I did not expect it to be a hit’, but that ‘I was not prepared … for UCW to be so widely ignored’ (personal correspondence). 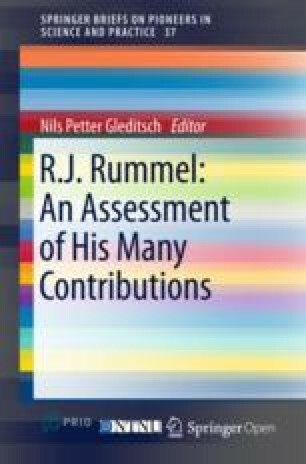 Nevertheless, Rummel received 15 research grants, authored over 70 articles, and 21 books, one of which (Applied Factor Analysis, 1970), was selected by the Institute of Scientific Information as a ‘Citation Classic’, so the point here is not that Rummel in general labored in vain or in obscurity. But subsequent to the publication of UCW, the democratic peace proposition received an enormous amount of attention. Unfortunately, even when Rummel’s contribution to the formulation and exposition of this idea is recognized, the specific citations are usually limited to a couple of derivative articles, published after UCW (i.e., Rummel 1983, 1985). And Rummel’s role in bringing the democratic peace proposition to the fore is far from universally recognized. For example, Spiro (1994: 50) asserts that ‘the absence of wars among liberal democracies was noted before (Doyle, 1983), but it was not seen as confirmation of any particular theory’, an intriguing statement in light of the five volumes of theoretical (as well as metaphysical and epistemological) elaboration upon which the democratic peace proposition is based in UCW. The point of this chapter is that, especially in light of the subsequent level of interest in the democratic peace proposition, perhaps there are additional aspects of UCW that merit a more thorough consideration than they have received to date. I will highlight some of the theoretical notions and empirical implications to be found in UCW that are arguably especially undeserving of the absence of attention they have received. A special emphasis will be placed on the aspects of UCW that resonate with more current work, in complementary or competing ways. The first of Rummel’s five volumes, The Dynamic Psychological Field, addresses basic questions regarding human behavior. Rummel argues that it is a function of dispositions weighted by expectations, and also of personality weighted by perceived situations. He then places individuals within a sociocultural context, stressing that personality, society, and culture form a continuous whole, and that they interact within a ‘field’. It is here, too, that Rummel begins to develop a theme about the importance of status as a determinant of an individual’s behavior. This first volume also dwells at some length on the question of whether or not people have a ‘free will’. He feels that most social scientists tend to see the behavior of human beings as determined. He resolves this dilemma for social science, at least to his own satisfaction, by arguing that the human will is free at the underlying level of ‘things-in-themselves’, while at the level of phenomena it is determined, thus making it a suitable target for scientific investigation. The first volume concludes with the development of a metaphysical, epistemological framework called ‘intentional humanism’, which integrates human perceptions, attitudes, personality traits, and needs with sociocultural, physical, and biophysical surroundings. In the second volume, The Conflict Helix, Rummel focuses on human interaction, and on the impact of distance with respect to status on relationships between social entities. He also differentiates between types of power. Bargaining power is distinguished from coercive power, and from authoritative power. What distinguishes national societies from each other most fundamentally, according to Rummel, is the type of power that is most prevalent in relationships within those societies. Bargaining power is the basis for exchange societies; authoritative power predominates in closed, aristocratic, or traditional societies; while coercive power is the most important distinguishing characteristic of totalitarian political systems, in which elites use such power to propel society toward some ideologically inspired goal. Rummel’s analysis of empirical data leads him to conclude that these ideal types do in fact conform to the existence of exchange (or libertarian, or democratic), authoritative, and totalitarian political systems in the ‘real world’. In the third volume, Conflict in Perspective, Rummel compares his theory of conflict and violence with others, and concludes that his is superior to or subsumes the most prominent alternatives. He argues that his theory suggests that aggression is both instinctive and learned. Rummel, like Marx, argues that class conflict is important in most societies; however, for Rummel the two most fundamentally important classes are the rulers, on the one hand, and the ruled, on the other. He feels that cross-pressures among groups can mitigate such conflict in exchange societies, but in others class conflict between the rulers and the ruled is also potentially, and often in fact, dramatically violent. Only decentralization, or ‘democracy’, can solve this problem. It is in the fourth volume, War, Power, Peace that Rummel deals most specifically with international relations in general and international conflict in particular. He offers propositions, as opposed to hypotheses about conflict, which he defines as ‘definite affirmations about conflict grounded in a perspective on man’s psychology, society, and conflict’ (Rummel, 1979: 211), that is, statements that are more definitive and less tentative than hypotheses. There are 54 propositions in all, 33 of which focus specifically on the causes and conditions of conflict. It is in this volume where the democratic peace, or the interdemocratic peace proposition, is first presented. The Just Peace, the final volume, is devoted to an effort to demonstrate how Rummel’s theory of conflict can have a profound impact on the future of international politics. ‘My answer …’, he asserts at the outset of the volume, can be put simply: ‘promote freedom’ (Rummel, 1981: 15). He defends this answer through the development of a social contract model. That model relies importantly on a first principle of John Rawls, which is that a society should be devised and structured in such a way as self-interested people would have it structured if they are ignorant of their own interests and the positions and advantages they would have in that society. Neither Rummel’s work in general, nor UCW in particular, is generally perceived to be particularly relevant to theoretical nor research concerns focused on the international systemic level of analysis. Nevertheless, there are systemic level implications of the theoretical approach to conflict developed in UCW that are among its unexploited aspects. Among the 33 basic ‘theoretical propositions on the causes and conditions of international conflict behavior’, there are two that focus on the relationship between polarity and international conflict. The first is ‘polarity stimulates intense violence’, (Rummel, 1979: 284), and the other is ‘polarity inhibits nonviolent conflict and low level violence’, (Rummel, 1979: 288). Though these appear contradictory, in fact they jointly posit a curvilinear relationship. Another related proposition relevant to analyses of the international system asserts that ‘cross-pressures inhibit intense violence’ (Rummel, 1979: 290). Perhaps the most intriguing derivation from Rummel’s theoretical approach in UCW regarding the international system is that ‘international relations are an exchange society with a libertarian political system’ (Rummel, 1979: 431), and that, accordingly, ‘international relations could be better characterized as a state of peace’ (Rummel, 1979: 46). Rummel follows up on the implications of such assertions and concludes that in general international politics are on average less violent than domestic politics. He asserts that ‘political regimes-governments-have probably murdered nearly 170,000,000 of their own citizens and foreigners in this century-about four times the number killed in all international and domestic wars and revolutions’ (Rummel, 1995a: 3). The implication of Rummel’s theory that international politics are on average less violent than domestic politics certainly qualifies as one of those counter-intuitive findings that are supposed to be a hallmark of valid and valuable theory.2 A related counter-intuitive notion would assert that international law, contrary to continual disparaging remarks to the contrary about it, is actually more effective than domestic law. In sum, Rummel’s UCW has intriguing, mostly unexplored implications for analyses of international politics on the systemic level of analysis. Quite consistently, Rummel refers to the ‘free societies’ as ‘libertarian’ rather than ‘democratic’. ‘Libertarian’ states, by his definition, must rely to a substantial extent on ‘free markets.’ In other words, socialist states, even if they are ‘democratic,’ are not ‘libertarian,’ and therefore may not, in his view be peaceful in their relationships with each other. This theme in UCW is arguably an important precursor to arguments emphasizing the pacifying impact of free markets or capitalism, even as opposed to ‘democracy’ per se (Gartzke, 2007; Mousseau, 2013). Mousseau in particular, emphasizes the pacifying impact of the degree of ‘contract intensity’ in a society. Rummel (1976: 310) asserts that an essential feature of ‘libertarianism’ to which he attributes significant pacifying impact is the ‘freedom to contract’. But there are other dyadic-level propositions in UCW that deserve more attention, partly because they overlap with other important sectors of research on international conflict. This might suggest that the framework developed in UCW has untapped potential to integrate, or even subsume, those other approaches. For example, an ‘age-old theme of international politics’ suggests that ‘uneven rates of growth in power are the fundamental cause of both war and change in the international system’ (Schweller, 1992: 237). The roots of the idea go back at least to Thucydides. More recently, the idea has been espoused in terms of hegemonic stability theory (Gilpin, 1981), long cycle theory (Modelski, 1978; Goldstein, 1988; Thompson, 1988), theories about preventive war (Levy, 1987), power cycle theory (Doran & Parsons, 1980), and power transition theory (Organski, 1968; Organski & Kugler, 1980). These theories have had a definite tendency to focus on major powers and the impact of transitions as well as re-distributions of power on the international system as a whole; therefore, many of them are perceived as system level theories (see, for example, Midlarsky, 1989). But they focus most intently on dynamics of interaction involving pairs of states. In addition, recent evidence suggests that the logic and impact of power transitions, for example, are not necessarily restricted to major powers, or world hegemons and challengers (Lemke, 1995). The approach to international conflict developed by Rummel resonates with, could be integrated with, and might even be interpreted as subsuming all of these strands of theoretical work and empirical analyses focusing on the impact of changes in power ratios between states. The first three of the 33 theoretical propositions on the causes and conditions of international conflict behavior presented by Rummel in Volume 4 of UCW are as follows: (1) Conflict Behavior occurs if and only if a mutual structure of expectations is disrupted; (2) Tension and hostility occur if there is a significant shift in the ‘balance of powers’; and (3) Conflict Behavior occurs only if there is a significant shift in the ‘balance of powers’ (Rummel, 1979: 262). These propositions bear an obvious relationship to others focusing on the impact of changes in power distributions or ratios. The relationship is made even stronger by two additional propositions constituting the theoretical edifice developed in UCW, i.e., ‘Power parity is correlated with war’, and ‘An actual or growing weakness of the status quo party compared to the anti-status quo party is particularly correlated with violence’ (Rummel, 1979: 264). Another recent stream of research on international conflict and war has focused on recurring crises and enduring rivalries. Leng (1983, 1993), for example, has analyzed the impact of recurrent crises on the bargaining behavior of the disputants, and vice versa. Gochman & Maoz (1984) note that a large portion of the world’s militarized conflict is accounted for by a relatively small number of pairs of states that have come to be known as ‘enduring rivals’ (Goertz & Diehl, 1992, 1993). All of this research is obviously congruent with a basic aspect of the theory of conflict developed by Rummel in UCW, namely that ‘conflict is helixal’. More specifically, Rummel argues that ‘no conflict begins … de novo, without history. Leaders and peoples learn. Each conflict is informed by previous ones … Each successive turn from cooperation to conflict to conflict is at a higher level of experience and insight between the parties; each turn incorporates what was learned before’ (Rummel, 1979: 337). There certainly appears here to be substantial room for progress toward theoretical integration of recent work on recurring crises and enduring rivalries and the approach toward international conflict developed by Rummel in UCW. Another important strand of research on conflict between pairs of states emphasizes the impact of geographic contiguity or proximity as well as territory. The impact of territorial changes on conflicts between states ties in nicely with research focusing on recurring crises or enduring rivalries. For example, Goertz & Diehl (1992) report that the likelihood of a subsequent conflict between enduring rivals if an episode in the rivalry involves territorial change is affected by various characteristics of that territory and the process by which it is transferred. Similarly Hensel (1994: 281) finds that for enduring rivalries involving Latin American states from 1816 to 1986, ‘conflict between the same two adversaries is … more likely when territorial issues are under contention’. Recent research on the impact of regime type on conflict between states has taken note of the importance not only of democracy, but of the distance, or differences between states in regime type, to an understanding of the conflict proneness of those states. Oneal & Ray (1997: 751) conclude, for example, that ‘the political distance separating states along the democracy-autocracy continuum is an important indicator of the likelihood of dyadic conflict …’ Bremer (1996: 28) comes to the similar conclusion that ‘political dissimilarity [that is, differences between democracies and autocracies] seems to encourage conflict …’. These findings support Rummel’s (1979: 296) argument that ‘differences (distance vectors) in wealth, power and politics are of all differences the most correlated with conflict behavior …’ and that ‘power, wealth and political distance reflect the primary lines of opposition among … states’. Russett (1995a, b: 268–269) notes that three recent important works on international conflict (Bueno de Mesquita & Lalman, 1992; Maoz, 1990; Vasquez, 1993), have in common the notion that foreign policy decision making ‘may vary with international context… But in no case is it purely endogenous to the international system …’. Russett goes on to point out that ‘the process is likely to be markedly different for different countries. And the process is also importantly interdependent as a dyadic phenomenon.’ By this point, the relevance of UCW to this characteristic theme in these three volumes regarding the impact of domestic politics on foreign policy choices, and regarding the importance of analyzing these choices within a dyadic context, should need no more elaboration. Whether or not democratic states are less war prone, period (a national-level idea) rather than just less war prone in their relationships with each other (a dyadic-level idea) is one of the most important questions to consider in the context of a discussion of Rummel’s work on international conflict.5 Chan (1984) and Weede (1984) challenged Rummel’s proposition that libertarianism correlates negatively with degrees of foreign violence, even though neither of them directly evaluated that idea. (Their models focused on war involvement as a dichotomous variable, rather than degrees of violence.) Those articles constitute an important part of the core of findings that lead to the continually repeated assertion that while democratic states do not fight wars against each other, they are as war prone and conflict prone as autocratic states (for two important examples, see Levy, 1988: 661–662 and Gleditsch, 1992: 369–370). So, the casual, or even the careful reader might understandably conclude that Rummel is a voice in the wilderness calling out against the virtually unanimous opinion and overwhelming evidence that democracies are not less war prone, or conflict prone than nondemocratic states, even though they do not fight wars against each other. But in fact there is substantial evidence to support Rummel’s argument that democratic states are less prone to violence, escalation and war than undemocratic states in general, not just in their relationships with each other. A partial list of sources of that evidence would include Geller (1985), Maoz & Russett (1992), Maoz & Abdolali (1989), Morgan & Schwebach (1992), Bueno de Mesquita & Lalman (1992), Bremer (1992), Rousseau, Gelpi, Reiter & Huth (1996), and Benoit (1996) in the more recent era, as well as East & Gregg (1967), Salmore & Hermann (1969), and Zinnes & Wilkenfeld (1971) from earlier decades. Huth (1996: 187), in effect, speaks for all of these sources when he concludes that ‘the findings in this book challenge the conventional wisdom that democratic states are only more pacific in their political and military relations with other democracies …’. If true, this finding tends to disconfirm all those theoretical approaches that imply that democratic states are more peaceful only in their relationships with each other, while it provides support for Rummel’s theoretical arguments. Another reason that Rummel’s approach in UCW in general, as well as its national-level ideas in particular, may be deserving of more attention has to do with the apparent increasing prevalence of intranational, as opposed to international violence in the contemporary international system. Interpretations of this trend should take into account the fact that intrastate wars have been considerably more common that interstate wars for a long time. Sarkees & Wayman (2010: 564–565) report that there were 95 interstate wars between 1816 and 2007, while during that same time period there were 335 intrastate wars. Furthermore, there were more interstate war onsets than intrastate war onsets in only one decade during this time period (1937–46). Nevertheless 229 out of the 335 intrastate wars occurring between 1816 and 2007 (or 68%) have taken place just since 1982, while only 13 interstate wars began during that same time period. Granted, this proliferation of intrastate wars in recent decades might be accounted for in part by the larger number of states coming into existence in that time period. But the number of pairs of states that in principle could have become involved in interstate wars increased much more rapidly in those same decades. If we focus on the most recent data, we see that ‘what stands out in the 21st century is the lack of large-scale interstate conflict’ (Pettersson & Wallensteen, 2015: 537). In 2014 specifically, there were 40 armed conflicts resulting in at least 25 battle-related deaths, only one of which was an interstate conflict. In that same year, there were 11 wars, with at least 1,000 battle-related deaths, all of which were intrastate conflicts. It is particularly interesting, then, that Rummel (1994, 1995a) turned his attention to domestic political strife, and that he did so in a way based on the theoretical approach to conflict developed in UCW. One of the basic 33 propositions on the causes and conditions of conflict behavior in UCW asserts that ‘intense violence will occur only if there is an expectation of success’ (Rummel, 1979: 263). In spite of this potentially important overlap between the approach to conflict developed in UCW and rational choice theories, for example, Rummel’s theory is not ‘formal’. ‘The … theory presented here’, Rummel (1979: 211) observes, ‘… is a comprehensive perspective involving hard theory (equations and explicit logic) integrated within a philosophical, metasocial and intuitive framework.’ Even though Rummel’s approach is not reducible to an ‘axiomatic system’, he does provide 33 propositions on conflict that are closely inter-related, and based on an extensively developed theoretical, as well as epistemological (even metaphysical) framework. A substantial portion of the theoretical and empirical work in the field of international relations today is either formal in nature, or when it moves beyond bivariate theoretical notions, has a tendency to bring in additional factors and hypotheses in a basically arbitrary (even if usually intuitively plausible) or ad hoc fashion. In UCW, Rummel may provide not only a valuable source of theoretical guidance and inspiration. Analysts who want to develop better theory, but are disinclined for whatever reason to rely on formal methods need an alternative. RJ Rummel’s Understanding Conflict and War may provide such an alternative. This chapter is a shortened and revised version of Ray (1998). Material from this article is reprinted by permission of the publisher. Several contributors to this volume made comments for the 2015 ISA panel devoted to R.J. Rummel’s work that are reflected in the revisions. Nils Petter Gleditsch offered several specific and useful revisions and suggestions. ‘A beautiful model is unpredictable. It produces some interesting implications that are surprising to us’ (Lave & March, 1975: 61–62). Rummel goes on to explain that ‘violence should almost never occur between exchange societies due to cross-pressures, the diversity of internal groups and interests, and the limited and responsive nature of libertarian government … In other words, pluralistic democracies with limited government form islands of nonviolent relations’ (1979: 374). However, Rummel’s emphasis on the importance of a stable status quo to the preservation of peace discussed above is quite congruent with Gibler’s work on the impact of stable borders. This section relies extensively on a discussion in Chap. 1 of Ray (1995).